1. J. Miller, You Can’t Kill the Spirit: Women in a Welsh Mining Valley (The Women’s Press, London, 1986), p. 29. 2. J. Winterton and R. Winterton, Coal, Crisis and Conflict: The 1984-85 Miners’ Strike in Yorkshire (Manchester University Press, Manchester, 1989) p. 1. 3. A. Brooks, ‘A Very Political Animal’, in T. Parker, Ed., Red Hill: A Mining Community (Heinemann, London, 1986) p. 111. 4. L. Sutcliffe and B. Hill, Let Them Eat Coal: The Political Use of Social Security During the Miners’ Strike (Canary Press, London, 1985) p. 40. 8. Miller, You Can’t Kill the Spirit, p. 22. 9. Campbell, ‘Proletarian Patriarchs’, in V. Seddon, Ed., Cutting Edge: Women and the Pit Strike (Lawrence and Wishart, London, 1986) p. 250. 10. J. Winterton, and R. Winterton, Coal, Crisis and Conflict: The 1984-85 Miners’ Strike in Yorkshire (Manchester University Press, Manchester, 1989) p. 128. 11. A. J. Richards, Miners on Strike: Class Solidarity and Division in Britain (Berg, Oxford, 1994) p. 150. 12. Miller, You Can’t Kill the Spirit, p. 19. 14. 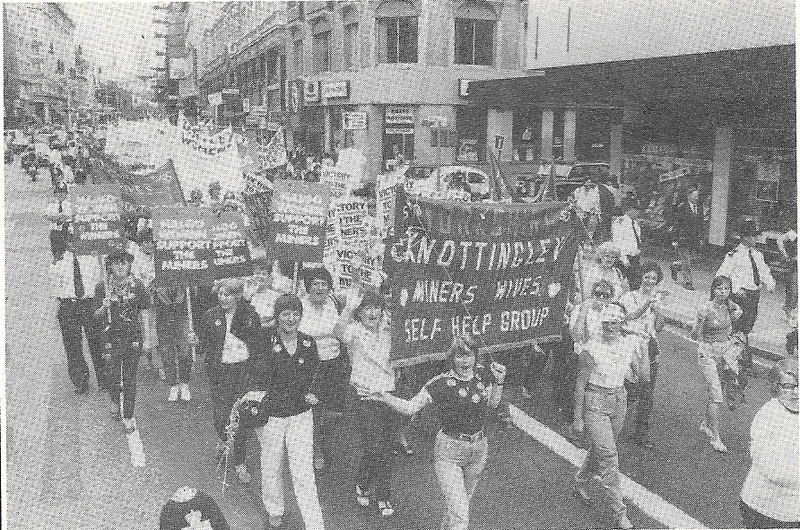 Barnsley WAPC, Women Against Pit Closures (Arc and Throstle Press, Todmorden, 1984) p. 10. 15. Notts Women Strike Back, Film. [Unknown Production] (1985). 16. Barnsley WAPC, Women Against Pit Closures, p. 16. 17. Miller, You Can’t Kill the Spirit, p. 19. 18. J. Stead, Never the Same Again: Women and the Miners’ Strike (The Women’s Press, London, 1987) p. 10. 19. A. J. Richards, Miners on Strike: Class Solidarity and Division in Britain (Berg, Oxford, 1994) p. 125. 20. Dolby, Norma Dolby’s Diary, p. 15 and p. 49. 21. Barnsley WAPC, Women Against Pit Closures, p. 28. 22. Barnsley WAPC, Women Against Pit Closures, p. 6. 24. Miller, You Can’t Kill the Spirit, p. 18. 25. Winterton and Winterton, Coal, Crisis and Conflict, p. 126. 26. Miller, You Can’t Kill the Spirit, p. 21. 28. ‘Notts Women Strike Back’ [Unknown Production] (1985). 29. Winterton and Winterton, Coal, Crisis and Conflict, p. 126. 31. Davies and James, ‘Women From the Valleys’, in Seddon, The Cutting Edge, p. 19. 32. Miller, You Can’t Kill the Spirit, p. 18. 34. Sutton, ‘Not the Most Important Person’, in T. Parker, Ed., Red Hill: A Mining Community (Heinemann, London, 1986) p. 141. 35. Brooks, ‘A Very Political Animal’, in Parker, Red Hill, p. 110. 36. Davies and James, ‘Women From the Valleys’, in Seddon, The Cutting Edge, p. 20. 37. Miller, You Can’t Kill the Spirit, p. 37. 38. Barnsley WAPC, Women Against Pit Closures, p. 19. 39. B. Elliot, Ed., Yorkshire’s Flying Pickets in the 1984-85 Miners’ Strike. BaseD on the Diary of Silverwood Miner Bruce Wilson (Wharncliffe Books, Sheffield, 2004) p. 49. 40. North Yorkshire WAPC, ‘We Are Women, We Are Strong…’, p. 52-53, and Barnsley WAPC, Women Against Pit Closures, p. 19. 41. North Yorkshire WAPC, Strike 84-85, p. 53. 42. Davies and James, ‘Women From the Valleys’, in Seddon, The Cutting Edge, p. 55. 43. Barnsley WAPC, Women Against Pit Closures, p. 38. 45. Barnsley WAPC, Women Against Pit Closures, p. 23. 46. Stead, Never the Same Again, p. 21. 47. Barnsley WAPC, Women Against Pit Closures, p. 40. 48. Stead, Never the Same Again, p. 14. 49. Beckwith, ‘Lancashire Women Against Pit Closures’, p. 1052, and Barnsley WAPC, Women Against Pit Closures, p. 29. 50. Stead, Never the Same Again, p. 22. 51. North Yorkshire WAPC, Strike 84-85, p. 60. 52. Barnsley WAPC, Women Against Pit Closures, p. 29. 53. Dolby, Norma Dolby’s Diary, p. 80. 54. Miller, You Can’t Kill the Spirit, p. 42. 55. Spare Rib, ‘Women Winning the Strike’ (Issue 147, October 1984), p. 26. Accessed 12/03/2011. 56. Barnsley WAPC, Women Against Pit Closures, p. 95. 58. D. Waddington, M. Wykes, and C. Critcher, Split at the Seams? Community, Continuity and Change after the 1984-85 Coal Dispute (Open University Press, Milton Keynes, 1991) p. 87. 59. North Yorkshire WAPC, Strike 84-85, p. 62. 60. Sheffield WAPC, ‘We Are Women, We Are Strong…’,p. 74. 61. National Coal Mining Museum, Strike!, p. 25. 62. Sheffield WAPC, ‘We Are Women, We Are Strong…’, p. 52.